One of my most favorite things to do in the summertime is to sit out on the deck with my husband after the kids are in bed. Those warm evenings when it seems to stay light forever are sacred moments. We get totally uninterrupted time to catch up on life, our plans for the future and the kids’ crazy antics. We laugh, we cry, (ok, it’s mostly me crying but sometimes a girl just has to get it out of her system right?) and we just get to reconnect. I’ll take him over Tom Cruise any day! And my husband makes us yummy cocktails to sip on while we watch the sun fade and the beautiful colors of sunset light the sky. I thought it would be fun this year to try my hand at enhancing our cocktail experience. 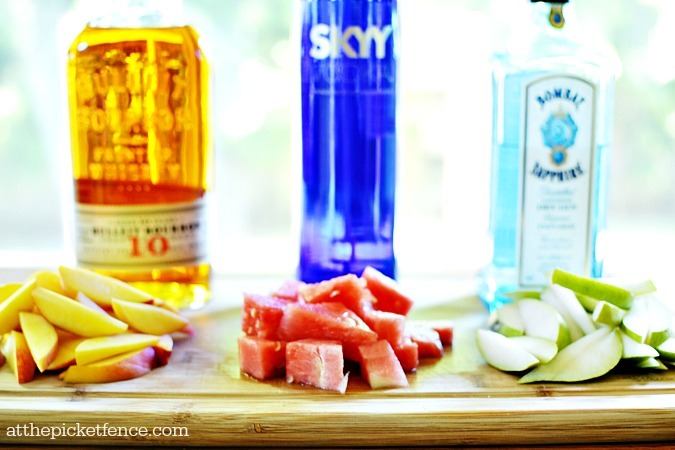 Determine which fruit and liquor combination you would prefer. 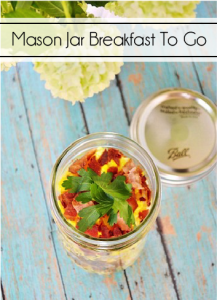 Slice fruit and place in mason jars. Pour in liquor and give it a few shakes. Store in a cool, dark room for 3-5 days. 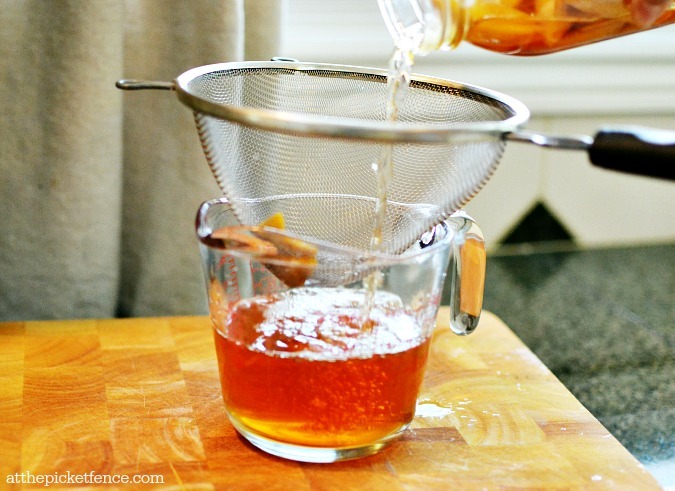 Pour the liquid out over a strainer into a measuring cup with a spout. Then pour into a bottle, attach a label and you’re ready to start enjoying those cocktails! I’m so thrilled to be joining an incredible line-up of bloggers this week as we celebrate all of our favorite elements of Summer! I hope you will pay them a visit for loads of ideas and inspiration! Thanks so much for meeting us here at the Fence today! 21 Comments on "Fruit Infused Liquor for Summer Cocktails"
You guys are looking great. Loved your post. I’m afraid Jane might pick Tom Cruise. Not sure. Have a great summer. These look amazing and I think hanging on the deck with your husband sounds wonderful. My husband would have to have a TV out there! Lovely pics too. Peach bourbon? Yes, please!! Thanks for such a great idea. I think I am going to throw some fruit in vodka give it a whirl. We are expecting a glorious weekend and something different for 5pm on the patio would be great. oh my… i feel like I have already had too many cocktails! 🙂 what a great idea for a refreshing summer cocktail. These sound fabulous, what a fun idea. What a fun series!! That peach infused bourbon sounds lovely. They all sound good! Pinned! Ah, Vanessa, I think your husband and mine would get along quite well. Our favorite thing is to sit on the front porch with a cocktail (although, of course, we’re out there BEFORE our kids go to bed–at 23, 21, and 17, our kids are up way after us!). My hubby makes the best Old Fashioned I’ve ever tasted, I must say–wish you could come over and sip one with us! 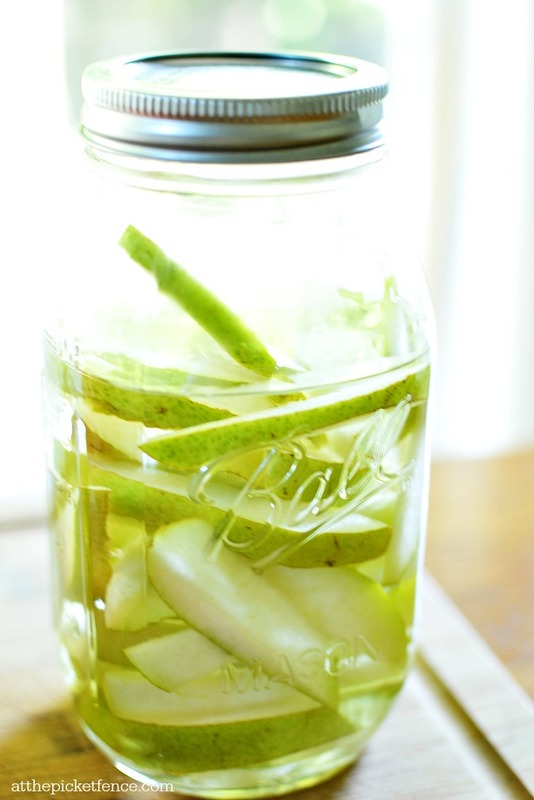 Thanks for the idea to make fruit-infused liquors. I’ll have to try this; they sound so fresh and summery! Oh my yummy goodness! I am right there with these delicious combos!!! I will certainly try these for summer. How fun!!! I just kept saying, “Oh MY Gosh!! !… Oh, MY Gosh!!! If it wasn’t 2:00 pm I’d go for one right now… watermelon please! I could just take a big bite or sip right out of your pictures!!! Oh my! 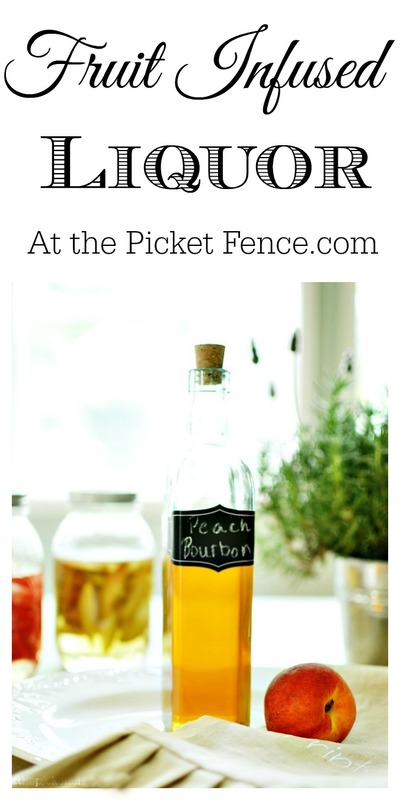 Now I can’t wait to get some ripe peaches so I can infuse them with bourbon! Thanks for the idea. Cheers! 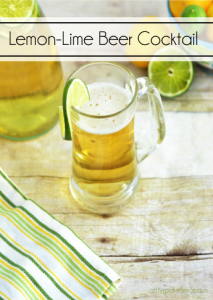 What a wonderful idea for a summer cocktail. 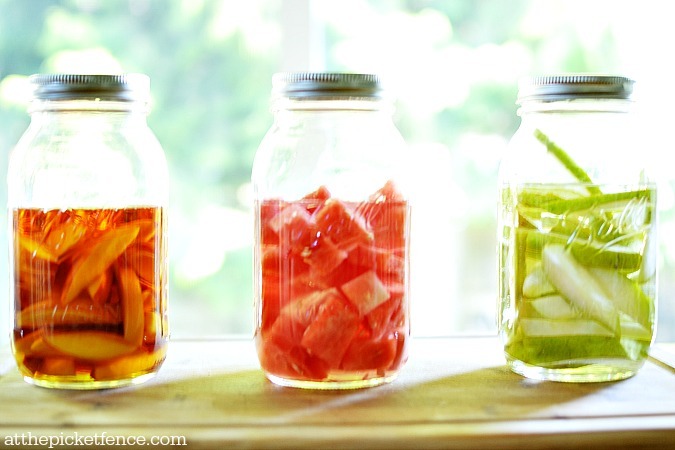 I hadn’t thought about infusing fruit with liquor. I’m going to try this over the summer. What a cool idea! I would’ve never thought to do this. Thanks for the tutorial! Those sound delicious! 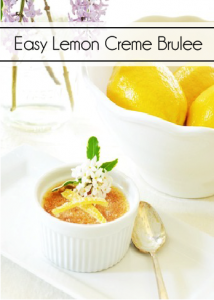 What a refreshing treat on a hot summer day! That is an awesome idea! 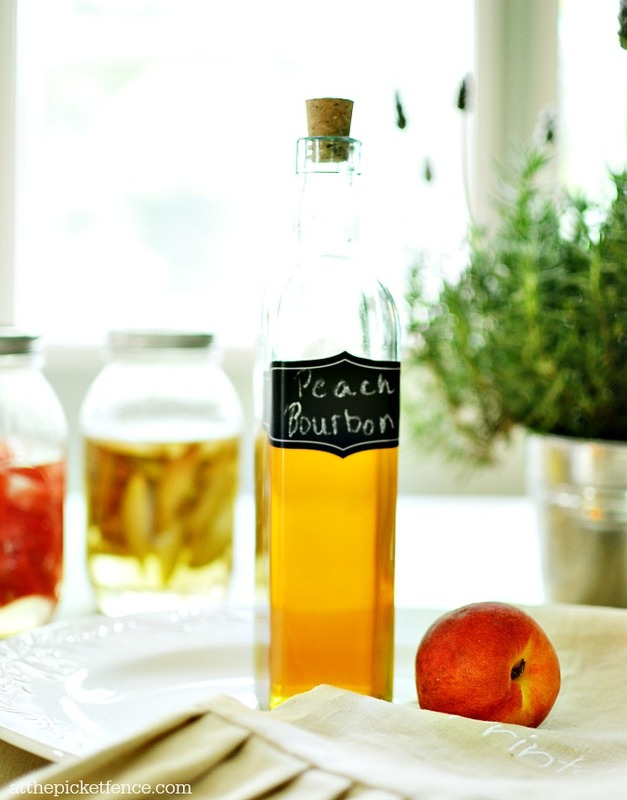 Peach bourbon sounds amazing!